Nominations for the American Go Foundation’s Teacher of the Year award are due by May 7th. Presented each year at the U.S. Go Congress, the award recognizes an outstanding American teacher. The winner will receive an all expenses paid trip to the US Go Congress. To be eligible a teacher must be a member of the AGA and have been teaching go to children for at least one hour a week for two years. There are new eligibility criteria this year, and the award is now open to other kinds of teachers as well. Click here for more information. If you would like to nominate someone for this award, including yourself, email mail@agfgo.org. Nominations are due by May 7th and should include a description of the teacher’s activities, how long they have been teaching, and how many students attend their program. - Paul Barchilon, E-J Youth Editor. Photo: 2018 AGF Teacher of the Year Ted Terpstra surrounded by a few of his many students. Get the latest go events information. Murakawa wins second Judan game: Game Two of the 57th Judan title match was held in the special playing room, Yugen, at the Tokyo headquarters of the Nihon Ki-in on March 29. 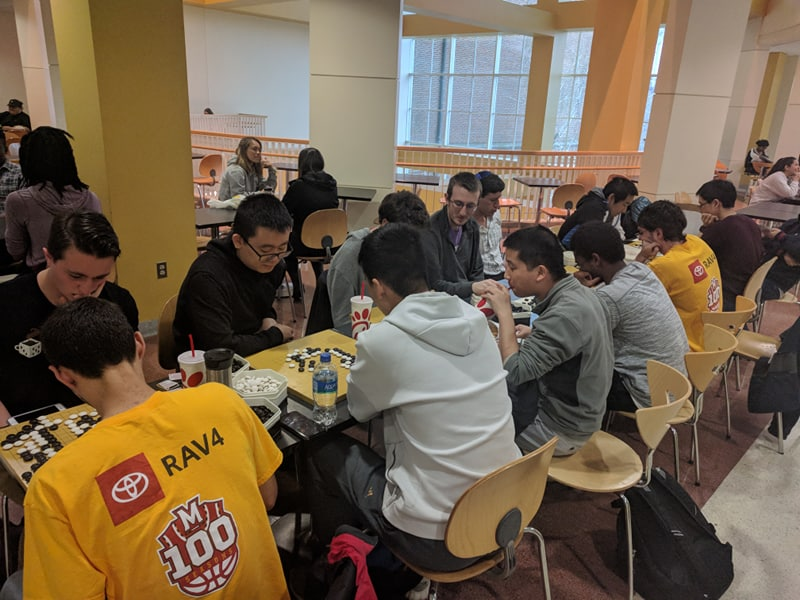 The time allowance for this tournament is relatively short, being just three hours per player, so the game was over by 5:23 p.m. (it started at 10 a.m.). Taking white, the challenger Murakawa Daisuke 8P won by resignation after 154 moves, so he evened the score at 1-1. Iyama was a little dissatisfied with his opening, so he tried to make the fighting as complicated as possible, with an ambiguous sacrifice of a group that he later was able to save. However, Murakawa found the right timing to simplify a large-scale fight, and this made the difference. The win is quite significant for Murakawa: it put an end to a losing streak to Iyama of 13 games, which was part of a career record of three wins to 18 losses. Those three wins came in the 62nd Oza title match in 2014 when he beat Iyama 3-2. He lost the three other title challenges he made to Iyama. The third game will be played on April 11. 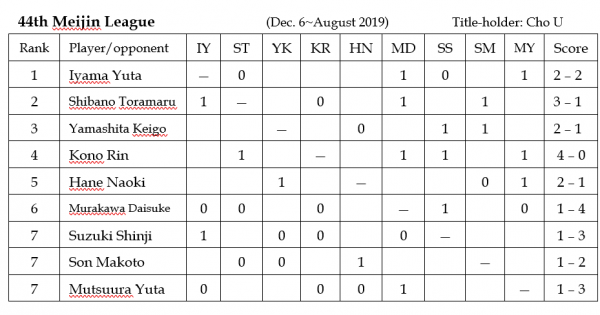 Kono leads Meijin League: There has not been much action in the 44th Meijin League in recent weeks. After the March round, Kono Rin, on 4-0, had the sole lead. So far, only one game in the April round has been played. 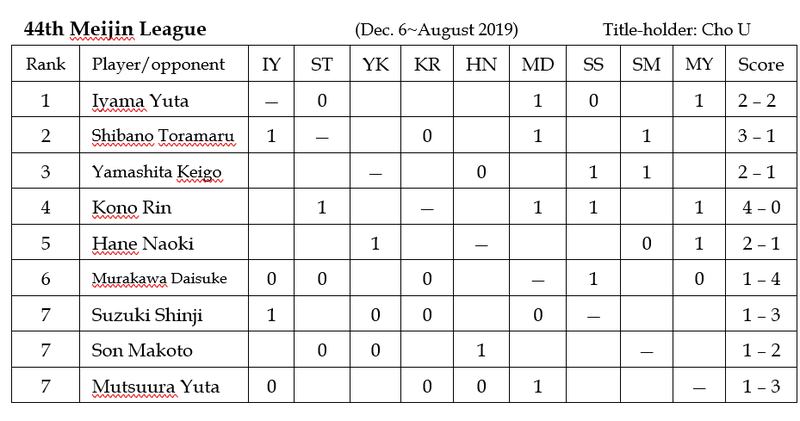 Iyama Yuta recovered to even his score after his bad start, so he is still in the running to win the league, though he will need help from someone else to drag Kono down (he himself plays Kono in the July round). (March 21) Hane Naoki (W) beat Mutsuura Yuta 7P by resig. (March 28) Yamashita Keigo (W) beat Suzuki Shinji 7P by 3.5 points. (April 4) Iyama Yuta (B) beat Murakawa Daisuke 8P by resig. Takemiya and Kikuchi receive awards: Every year awards are presented by the Agency for Cultural Affairs honoring persons and bodies who have made significant contributions to Japanese culture. 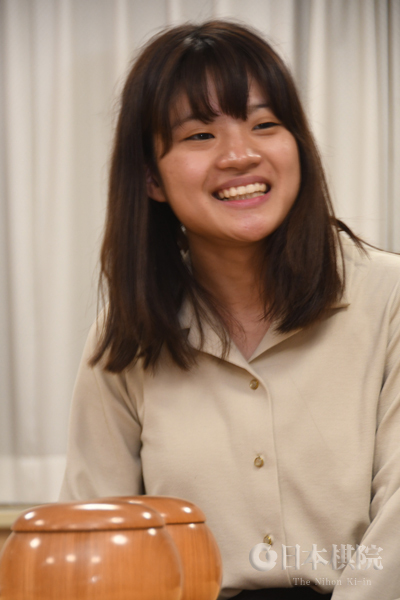 This year the Commissioner for Cultural Affairs Awards for 2018, as they are called, were given out at a ceremony held on March 18 and for the first time go players were included. Takemiya Masaki 9P, who, as the great exponent of cosmic or center-oriented go, has been one of the most popular Japanese professionals over the last four decades, was recognized for his success in local and international tournaments. Also receiving an award was Japan’s top postwar amateur player, Kikuchi Yasuro, who has made major contributions to spreading go. As a player, he won many Japanese amateur championships and also won the World Amateur Go Championship. 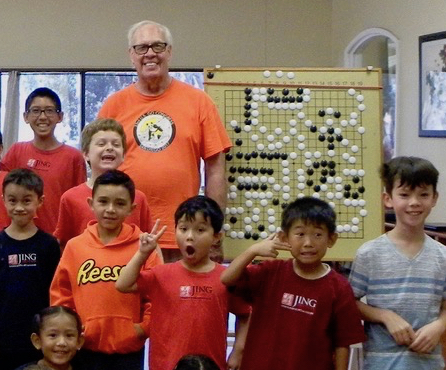 He has held posts in a number of organizations, including one that is active in popularizing go amongst children. He is probably best known for founding the Ryokuseien Go School, whose most famous graduate is Yamashita Keigo. He will turn 90 on August 20. Kumasu Ken’ichi, a maker of traditional go and shogi boards, also received an award. Three honorees in the go world may sound good, but actually awards were handed out to 86 individuals and three organizations. If that many people get awards every year, it’s a little strange go has had to wait so long. World Go Championship results: A report on this tournament was given on March 20 in the ejournal. Some time has passed, but, for those interested, here are details of the results. (March 18) Iyama Yuta 9P (Japan) (B) beat Jiang Weijie 9P (China) by resig. ; Shin Jinseo 9P (Korea) (W) beat Cho U 9P (Japan) by resig. ; Park Junghwan 9P (Korea) (B) beat Liao Yuanhe 7P (China) by resig. ; Ke Jie 9P (China) (W) beat Yu Changhyuk 9P (Korea) by resig. (March 19) Ke (B) beat Iyama by resig. ; Park (W) beat Shin by resig. (March 20) Park (B) beat Ke by 1.5 points. First prize is 20,000,000 yen (about $180,000). Fujisawa defends Women’s Meijin: The third game of the 31st Women’s Meijin title match was held at the headquarters of the Nihon Ki-in in Tokyo on March 22. Fujisawa drew white in the nigiri and won by resignation after 282 moves, so she defended her title 2-1. She won this title for the third year in a row. Xie Yimin remains in her unaccustomed state of having no title to her name. 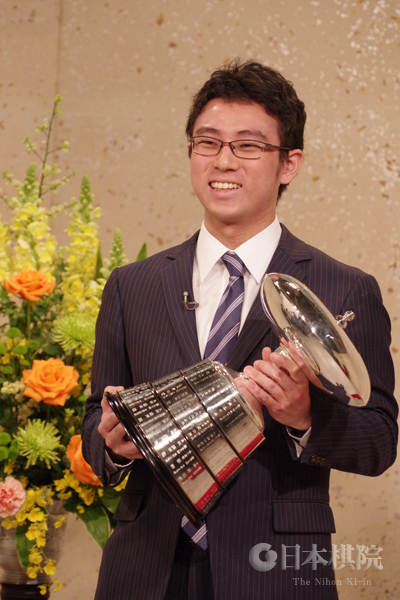 Ichiriki wins NHK Cup: The final of the 66thNHK Cup was telecast on March 24. The finalists were Iyama Yuta, Quintuple Crown, who was bidding for his third successive cup, and Ichiriki Ryo 8P, who was hoping that this would be third time lucky. Ichiriki lost the 62nd final to Ida Atsushi in 2015 and the 64thfinal to Iyama in 2017. The latter is part of a lopsided record against Iyama of six wins to 18 losses. 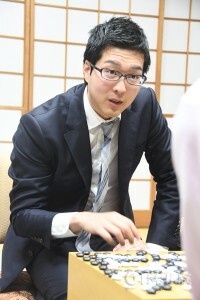 Ichiriki, aged 21, is often spoken of as the top player of the post-Iyama generation; fittingly, he beat two other top players of that generation on his way to the final: Yo Seiki in the quarterfinals and Kyo Kagen Gosei in the semifinals. As usual, the opening showed the influence of AI go in various places. Ichiriki (white) did well in the early fighting and took the initiative, but the lead then changed hands a number of times. Iyama took the lead, thanks to a slip by Ichiriki, but his policy of always playing the strongest move backfired, letting Ichiriki back into the game. To save a group, Iyama had to resort to a gote seki, which meant that Ichiriki scored a success. In turn, the latter chose the strongest move: instead of solidifying territory with a safety-first move, he made a strong attack on a black group. There were more twists and turns, but in the end the game was even on the board, so Iyama resigned after move 182. This is Ichiriki’s second title win against Iyama, following the 25thRyusei final in 2016. In “fast” games (defined as two hours and under), he now has a lead of 4-1 against him. First prize in the NHK Cup is 5,000,000 yen (about $46,000). Both players will represent Japan in the 31st TV Asia Cup.